CLASS was founded in 1951 by a group of parents, medical personnel, educators, and other stakeholders. It was originally chartered as an affiliate of United Cerebral Palsy to serve Allegheny County and the City of Pittsburgh. In 2013, CLASS became independent of the National UCP Organization. Growing from a small diagnostic clinic linked to Children’s Hospital, CLASS now reaches thousands of people directly and indirectly in multiple counties across southwestern Pennsylvania. Initially, CLASS focused efforts on programs for school age and preschool children. As similar services developed in the Pittsburgh area, the focus shifted to much needed adult programs. CLASS currently offers residential services, community skills training, vocational programs, attendant care services, outreach, and advocacy. Since 1965 programs like information and referral and community follow along services through the Elks Home Service Nurse Program have been offered. Community Skill Building and supervised Residential Programs both began in 1975. Specialized services for persons with traumatic brain injuries began in 1984. The Vocational and Supported Employment Program was initiated in 1986. In that same year, a team of case managers/community partners was developed to provide support to people in the community who needed nontraditional case management to assist them with living more independently in their homes and communities. This was named the Community Partners Program. In 1998, CLASS was awarded the Attendant Care contract. This program focuses on providing quality care, employs hundreds of direct care workers and supports over 200 men and women with disabilities; enabling people to live, work, and participate in the community. In the year 2000, UCP Kids Program was created to provide recreational opportunities to children with disabilities in the same venues as their non-disabled peers. This program later saw success with their T.E.A.C.H.E.R. program and Vocational Ventures endeavor. 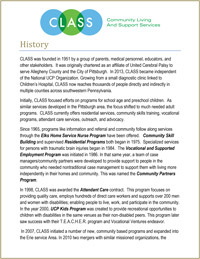 In 2007, CLASS initiated a number of new, community based programs and expanded into the Erie service Area. In 2010 two mergers with similar missioned organizations, the Multiple Sclerosis Service Society (MSSS) and the Alliance for Community Respite Care occurred. Through these programs CLASS was able to provide additional support to families and caregivers of people with disabilities, through peer counseling and information and referral services to people with multiple sclerosis (MS) and related conditions. In 2012, CLASS realized another unmet need of the disability community and instituted its Assistive Technology and Home Modification services; programs that provide consultation, technical assistance, and training for individuals with disabilities and professionals with concerns related to increasing the accessibility of living environments. The program also assists businesses and individuals with understanding and accessing resources to provide accessible options that allow people to remain safely in their own homes. The Board of Directors represents all aspects of the Pittsburgh community. With a staff compliment of several hundred employees and additional staff for which CLASS serves as a payroll agent, the agency budget is $13.5 million dollars with funding coming from the United Way, Office of Vocational Rehabilitation, Allegheny County Department of Federal Programs, Mental Health/Mental Retardation Office, Office of Long Term Living, various contracts with private organizations and private insurance. With a dedicated board of directors, enthusiastic consumer/family base, and a committed staff, CLASS is an incredible asset to the health, welfare, and well-being of the local Pittsburgh community and to southwestern Pennsylvania in general.